As we wait to see which weathercaster performed best in predicting the current warmup and whether or not there may be a possible snow event next week to monitor, we thought we'd mention a few interesting weathercasting sites. Forecastwatch.com is a fellow "forecast grader" that evaluates national forecasting services. It's far more sophisticated than TMF and the grading system is much more exact than the simple letter grades we assign. It's clearly geared for a different audience than ours, but it's an interesting site and one that's probably worthy of your review nonetheless. 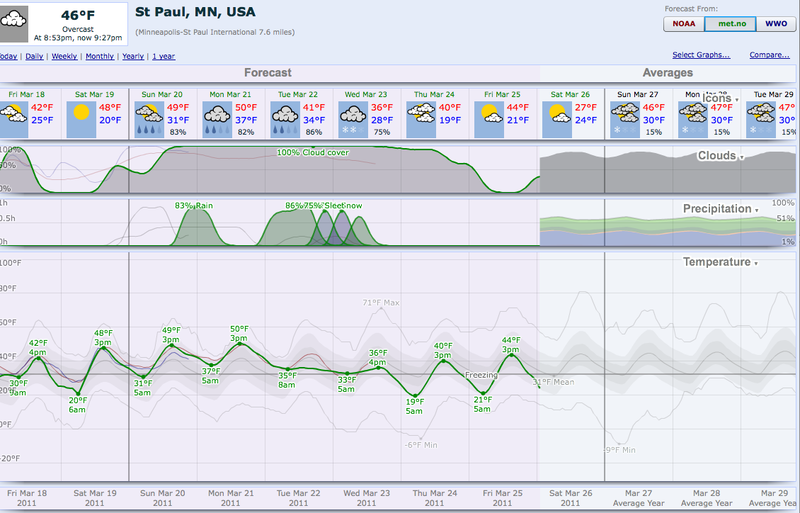 Another interesting site, thought it's not a forecast "evaluator," is weatherspark.com. It provides one heck of an amount of information in an interesting graphic format. What's particularly interesting about it is that you can choose weather information from a variety of models, including NOAA, the Norwegian Meteorological Institute (seriously, this is not a Minnesota joke) and World Weather Online, (See the upper right portion of the page to select a different weather model). Perhaps some of you have an idea which underlying models form the consensus for each of the weather sources. 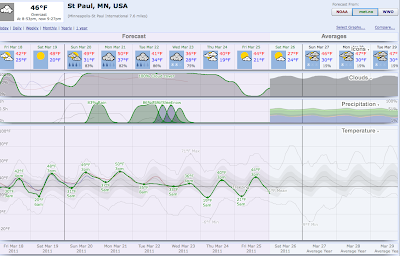 One model from WeatherSpark reflects a rain/snow/sleet mix for next week. Finally, if the long wait for the snow to melt is leaving you in need of a little comic relief, we offer up this television weather meteorologist. Enjoy the dribbling sounds of spring. Bill thanks for the info pretty cool stuff. So can the hypeometer begin,were inside of six days from possible storm,crap the last storm started about ten days,but it seems everyone to shy to even pull the discussion trigger on the next storm since the last one busted in everyone's face,well I can get it started pick your poison gas warm with heavy rain or euro on the cold side with heavy snow,let the model flip flopping begin,do we crack the top three for snowfall or does the flooding ax era ate quicker,either way looks grim.to bad PD isn't blogging or the hype would have started already. Just curious...Who here wants the snow to stop and who here wants to break the record? Not all... I don't have even the slightest desire to break any snow records... not desirable in my book at all. Yuck. Just the mention of the word snow is enough to cause instant nausea. Bill sound the hypeometer! Smells like a new post starting today, maybe titled Spring Snowstorm?,GFS and Euro in pretty good agreement for 4+ days out,but precip amounts look heavy IF all snow and favorable track of southeast of here I could see 8+ at this time,NWS is pretty bullish in their discussion page and most outlets have mentioned snow potential(heard kstp and strib to name a few)mpr as usual yesterday only discussed flooding,not a mention of any weather(you would think a possible heavy precip event would warrant some kind of mention)especially when it will effect the flooding they talk about.Traveling to fargo today for sandbagging weekend,ill check in from there. Does anyone know with this pending storm does it have a chance of dropping enough snow for the record and exactly how much more do we need for the record. We are currently at the 7th place on the all-time list. We would need more than 18.4 inches to go into #1. We would need 3.9 to move into the top 5. I think it is just too early to be forming opinions about next week - comparing all the local forecasts, to Accuweather, to NWS, to weather.com, to Wunderground, etc. it is clear there is a big variation in temperatures and precipitation potentials. Also, comparing the Brainerd and St. Cloud, MSP, and Rochester outlooks on NWS, it looks like a very inconsistent model set-up about a possible storm track that the NWS is using. I think, after all this hype, including that which was generated by this site by those desiring to set the snowfall record, with that storm that went SE a week ago where we didn't even get a 1/4 inch here in the Metro, is an example of why people are holding off and sitting back on making much of a statement about this. It is just plain unnecessary and while there are a number of weather nuts on here who like snow (I think perhaps the only ones in the state who actually want more snow this year are on this site) the vast majority of the populace has simply had it with this winter and wouldn't care if they ever saw another snowflake. On Highway 5 in Chanhassen, not far from NWS headquarters, there is a sign up that says, "Dear Winter, Surrender. - Spring" That is how 98% of people are feeling. Having said that, the 15 days models show moving back into the 50's and even a few 60's after next weeks brief cool down to the upper 30's and low 40's, so if we get a few inches, it will not stick. Amen. Prediction - we will not be breaking the record this year. Different Anonymous here, but the GFS has been trending north lately now giving much of North Dakota and Northern MN heavy precip tuesday-wednesday. Of course the euro may have another say on the track when it comes out later this afternoon. UKMET is on the side of the GFS and Euro, therefore at this time I see the Nam as a outlier. Seems to me two question's need to be asked, 1965 flood record's and seasonal snowfall record, if these three events verify...Thoughts any one??? Good info, Randy. Care to make a call on precip totals for Sunday? Given the flood potential, I sometimes wonder if forecasters may play up the rain potential in the same way they tend to hype snow. Sounds like I may need to create a post soon for a possible snow event for Tues/Wed. Interesting...Some forecasters are saying that there will be thunderstorms on sunday! A few models are hinting at it, too. Just in case anyone wanted to see this, here is what the very latest NAM model is showing for POTENTIAL precip amounts through Tuesday morning. Just copy and paste this image, and you'll be able to see it. http://i105.photobucket.com/albums/m203/duanewolter/NAM.gif The bottom right box is how much LIQUID could potentially fall, according to this one model. Not saying this is what is going to happen, just showing one models take on it. You can see a heavier band of precip in north central WI, extending into a small part of MN. I'm thinking this is because the model is picking up the possibility of convection (thunderstorms), and is overdoing it a bit...but it is something to watch over the coming days. Again, THIS IS NOT SET IN STONE YET, just the very latest for this one model in particular. Please note that we've added a new post to recognize the possible snow event for next week.